Word has been received of the homegoing earlier today of Dr. Jesse Humberd (pictured), longtime professor of math and science at Grace College, Winona Lake, Ind. Dr. Humberd apparently died in his sleep at his residence in the remodeled Winona Hotel on Park Avenue in Winona Lake. An obituary and arrangements will be published when available. Humberd, 87, was originally from Martinsburg, Pennsylvania. He had earned degrees from Bryan College in Tennessee, Grace Theological Seminary, and his doctorate was from The Ohio State University. He served in the U.S. Navy from 1942-1945 and from 1959 until his retirement from full-time teaching in 1991 he served in a wide variety of roles at Grace College and Seminary. He taught various courses in science and math, designed the college’s science building which was built in the late 1970s, was for many years Grace’s commencement marshal, spent a number of years working on getting the college accredited, headed up an investment club for Grace, and much more, including part-time employment at the Free Methodist Publishing House and as a psychometrist for the Veteran’s Administration. Dr. Humberd and his wife, Laura, have two daughters, Lenora and Margaret. Laura Humberd, who taught public school for many years in the Winona Lake-Warsaw area, died March 19, 2007, in her residence. The Humberds were longtime members of the Winona Lake Grace Brethren Church. Many generations of students and faculty at Grace College and Seminary were significantly influenced by Dr. Humberd. 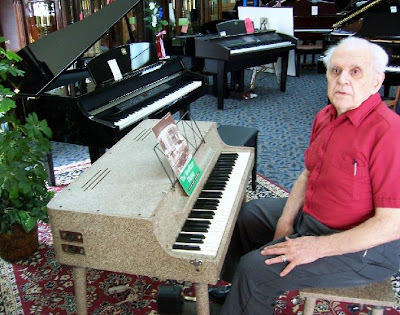 In this photo, Dr. Humberd several years ago sat at the keyboard of the Wurlitzer Model 112 electronic piano in the Fred Myer music company showroom in Fort Wayne, Indiana. In 1955 Dr. Humberd was the fifth customer who purchased the revolutionary new keyboard from the Fort Wayne dealer. The Wurlitzer Model 112 was introduced to the nation by Steve Allen and Steve Lawrence on the “TONIGHT” Show on NBC television.